At Orange County CyberKnife, we understand how difficult a cancer diagnosis can be, whether it’s for you or a loved one. If you or someone you know has recently been diagnosed with brain cancer in Orange County, this is probably an extremely difficult time. It’s normal to feel a wide range of emotions after a cancer diagnosis, and many people feel helpless after receiving the news – but there is hope. At Orange County CyberKnife, we’ve helped countless brain cancer patients overcome their cancer through state-of-the-art cancer treatments. First, let’s understand the facts of brain cancer and which treatment options are available to you. Primary Brain Cancer: This occurs when a normal brain cell degrades into a cancerous cell, multiplying rapidly and eventually forming a tumor. More than 35,000 people develop primary brain cancer every year. Brain Metastases: Sometimes, cancer starts somewhere else in the body – like the breast, lung, or colon – and spreads through the brain through the bloodstream or another bodily fluid. Patients with advanced cancer may develop brain metastases some 25 – 50% of the time, and the most common sources for brain metastases are the lung (50%), breast (15%), or melanoma, renal, and colon (6%). It is generally difficult to diagnose brain cancer purely through symptoms. In most cases, an imaging procedure like an MRI is required to diagnose brain cancer. At Orange County CyberKnife, we’re experts in using the most advanced radiation oncology techniques to eliminate cancerous tumors in the brain and other parts of the body. If you’d like to learn more about how we can help you overcome brain cancer in Orange County and reclaim a normal, healthy life, please feel free to call us at 714.962.7100 or reach out to us at our contact page. We hope to hear from you, and we look forward to partnering with you in your fight against cancer. Q. Who is at risk for a primary brain tumor? 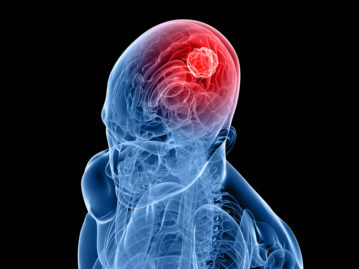 The exact cause of brain tumors is yet unknown. Physicians, therefore, usually cannot explain why one person develops a brain tumor and another does not. However, research has shown that people with certain risk factors (e.g., family history, exposure to radiation or certain other chemicals, coexistence of a disease such as neurofibromatosis) are more likely than others to develop a brain tumor. Q. Will I have a seizure? Not all patients with brain tumors experience seizures, but some do. If you have never had a seizure, there is a good chance you never will. Patients who have experienced a seizure are put on anti­seizure (anti­epileptic) medication. Some of the more common medications used are Dilantin, Keppra, Depakote and Tegretol. Your physician will determine the most appropriate medication and dosage for you. Q. What is the difference between a CT scan and an MRI? CT (computed tomography) scan uses an X­ray machine linked to a computer to take a series of detailed pictures of the head to reveal any tumors present in the brain. MRI (magnetic resonance imaging) uses magnetism, radio waves and a computer to produce detailed images of the brain. With both CT and MRI, the patient may receive an injection of a special dye to make abnormal brain tissue easier to identify in the pictures. Q. What is the difference between a primary brain tumor and a metastatic (secondary) brain tumor? Primary brain tumors arise in brain tissue, whereas metastatic, or secondary, brain tumors start as cancer cells in another part of the body and metastasize, or spread, to the brain through the blood stream. The most common types of tumors that spread to the brain are lung, breast, colon and kidney cancers, as well as malignant melanoma (skin cancer). Metastatic brain tumors are far more common than primary brain tumors. According to the American Brain Tumor Association, of the 190,000+ Americans diagnosed with a brain tumor each year, slightly more than 40,000 have primary tumors, while the remaining 150,000 have metastatic tumors. Q. Is a brain tumor cancer? Brain tumors are cancerous in some cases, but not all. Malignant (high­grade) brain tumors contain cancer cells, but benign (low­grade) brain tumors do not. In very rare cases, some benign brain tumors later develop into cancer. Two of the most common forms of brain cancer are metastatic brain tumors (cancers that have spread to brain tissue from elsewhere in the body) and glioblastoma multiforme, or GBM (the most aggressive form of gliomas­primary brain tumors arising from glial cells in the brain). Q. Are benign brain tumors harmless?